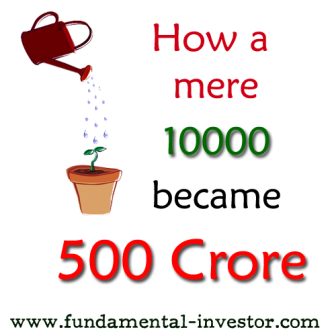 Fundamental Investor: How a mere 10000 compounded to more than 500 Crore? How are you all doing? So far in my articles, we have covered various fundamental concepts and I sincerely hope that you are able to appreciate the capabilities of this wonderful stock market, with patience and homework. We have seen how this whole thing begins with an IPO, then trades in the secondary market, power of compounding, systematic investment approach and the different kinds of shareholders. I had also written a piece on the Fundamentals of Investing in the Stock Market. Today, I am going to touch upon a highly thought provoking, interesting journey of some really long term investors. 350 kms away from the busy city of Mumbai, on the banks of the Bori river, in Jalgaon district, is a small city Amalner. In 1946, a company named Western Indian Vegetables Product Limited (WIPRO Ltd) was listed in the Stock Exchange. In 1947, the company's first plant was setup to make Soap, Vanaspati, Ghee and Edible Oil in Amalner by Mr. Mohammad Hussain Premji. Many residents of Amalner worked in the plant and eventaully became shareholders of the company. In 1966, highly respected, Mr. Azim Premji took over the reins of the company by becoming Chairman. A right's offer in the late 1970s wasn't fully subscribed and the Face Value of the Stock was Rs 100 at that time. There were investors who bought just 1 share of the company at that point in time since even a Rs.100 was a big deal. It might be interesting to note that the share price even moved down to Rs 35 without any buyers at one point in time. A few of them held on, with complete trust in the capabilities of the management. A resident of Amalner, Mohammed Anwar Ahmed's father owned a large farmland in the 1970's. After his father's demise, he had around Rs. 20000 with him. In 1980, while Ahmed sat near a tea shop, a young stock broker from Mumbai stopped to ask a question. This meeting would change the life of Ahmed. The broker had come to Amalner to buy as many shares as he could on behalf of some clients in Mumbai. The question that the broker asked was, “Do you know anyone here who owns shares in that factory?” pointing to the WIPRO plant. Ahmed replied that the owners of the factory stayed in Mumbai and that many residents worked in the plant and they would be holding shares of the company. In the next 15 minutes, the broker explained to Ahmed, how owning a share could make one a part owner in the company without working in the company. This made Ahmed inquisitive and the meeting lasted for 30 more minutes. Ahmed, completely convinced of the ownership model, helped the broker go door to door to collect shares from willing sellers (in very small towns nearly everyone knows each other) and for himself bought 100 shares of Rs.100 face value, thus investing Rs.10,000 from the total of Rs.20,000 that he had. Over the last 36 years, this is how his wealth has grown. It's been 36 years since Ahmed took the plunge in this ownership model. As I write this article, the share price of Wipro is around 540. The total worth of the shares is a mind boggling 518 Cr. He has also been receiving dividends which is cumulatively more than 100 Cr. Multiple residents of Amalner have benefited a lot by holding on to the shares of Wipro for the last 30 years. For them, Azim Premji, who transformed Wipro into an IT Giant is the reason, why they are still holding on to the shares. They believe that there is no reason to sell of their holding, when the leader is able and amazing. There are residents who sell around 10-20 shares a year and are able to meet all their needs. Now, what is the takeaway from this article. 1) Investing in a good company with visionary promoters is extremely important. 2) Holding the share as long as there is no fundamental change is definitely worth the wait. 3) There might be short term gyrations, but if the story is good, the stock will compound your money. 4) Dividends are extremely important and can create extreme wealth as the holding period increases and the business flourishes. 5) A good business will also give bonuses which will prove to be a great asset in the long term. Many times, we buy good companies, but we let go even when the story is intact. We look at the unrealized loss, forgetting about the unrealized potential of the stock. We also, try to time the market without spending time in the market. Friends, let us come out of this mindset of quick money. Let us be focused and try to create wealth over a period of time. Let me remind you that there are so many companies which are worth holding on in today's market at current prices. Think about it. Very nice real inspiration story for small investors which tells if we keep patience in our stock market investments for long time than we can definitely create a wealth for our families. Thanks Sir for sharing this real story. Its these type of periodic reminders that instill confidence in Long term investors in the face of short term Lollipops. Also helps beginners to set aside some earnings for investments. Absolutely Patrick bhai... Its important for all of us to have solid companies in our portfolio which will cushion our hard earned money in tough times. A small portion can be allocated for high risk..